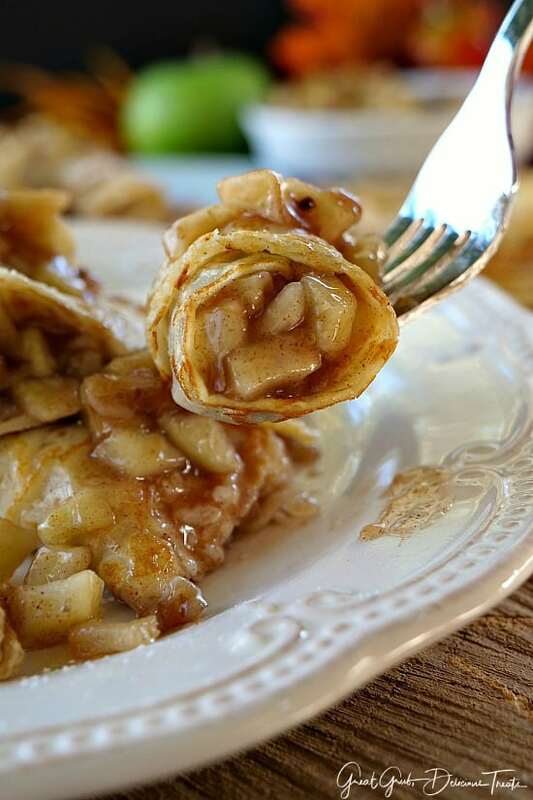 These apple walnut crepes are super easy to make. 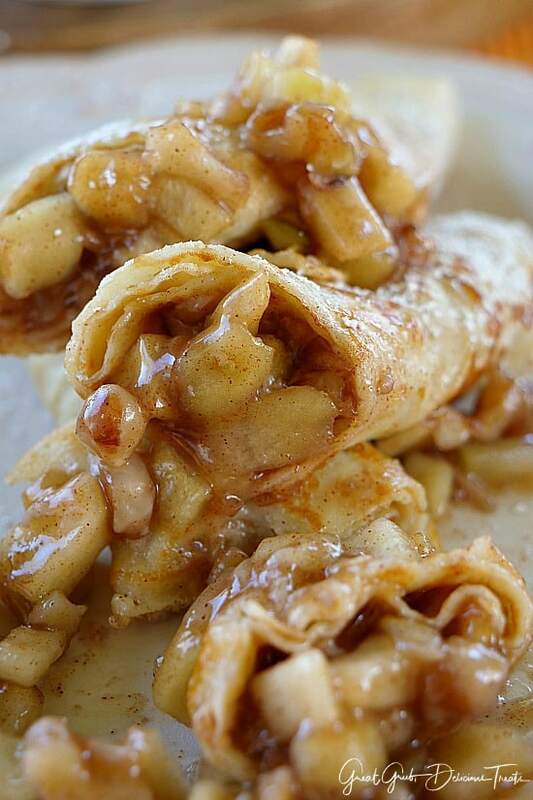 Each crepe is loaded with a delicious apple walnut filling then topped with powdered sugar. As the apple and walnut filling is simmering in the saucepan, the smell is amazing. 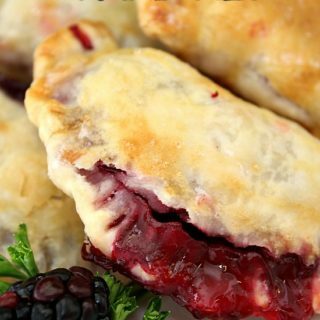 Nothing says fall like the aroma that fills a kitchen with the smell of delicious fall desserts. Having my home, especially my kitchen, smell like fall is the absolute best. The green apples (which have been difficult to find lately in my area, if you can believe that) have been staring at me every time I go into the kitchen. 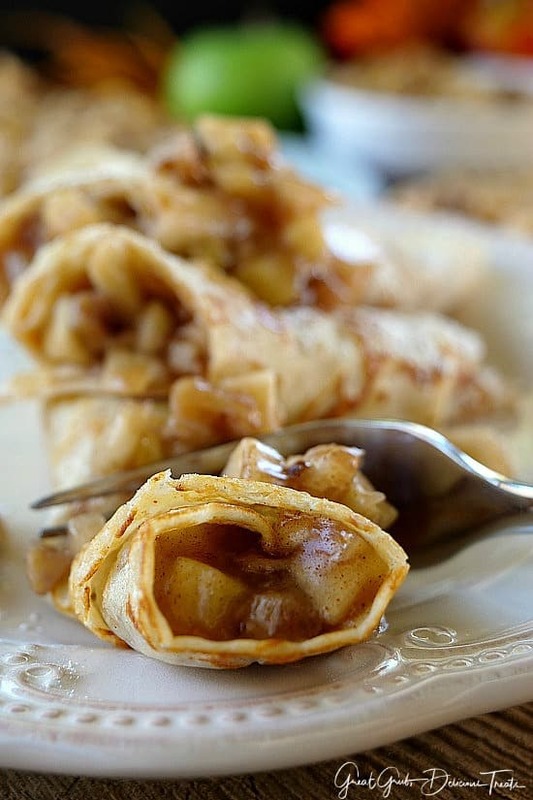 This morning I knew exactly what I was going to make, these tasty apple walnut crepes. 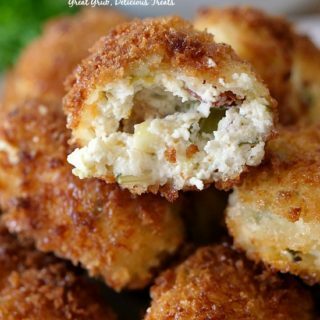 When you make these, pecans can be substituted instead of using walnuts. 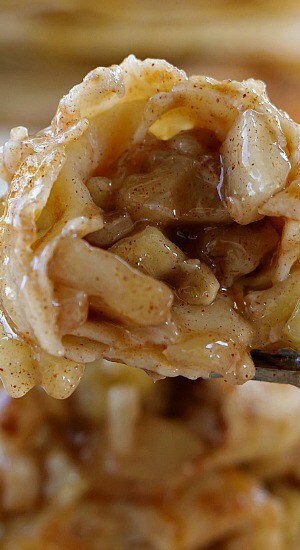 Many prefer pecans with apples but either works well with this dessert. So grab those apples, peel and chop them into small pieces. 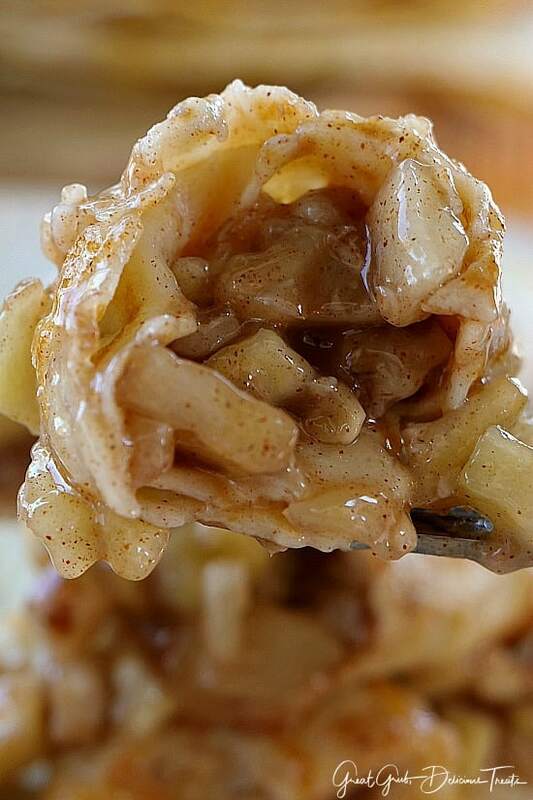 Using a medium saucepan, add all the ingredients for the filling, except the apples, and get that going. Once the sauce has thickened up, add the chopped apples and walnuts. Then simmer for 8-10 minutes stirring occasionally. 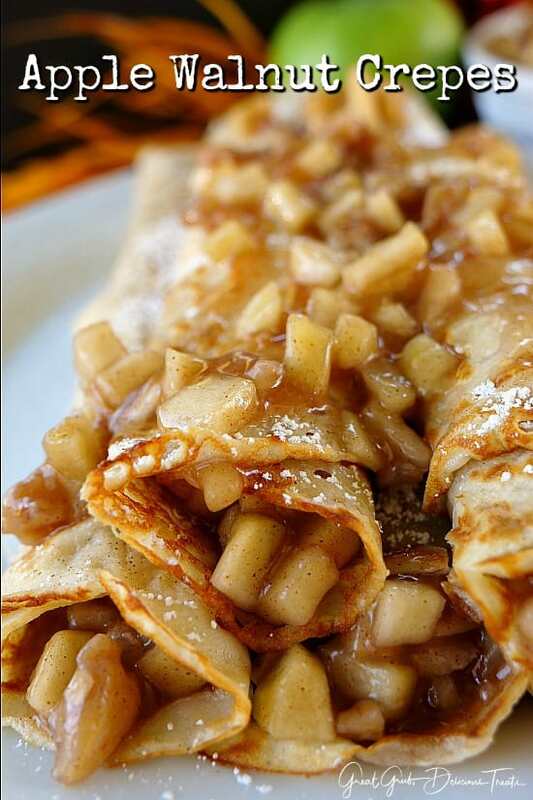 And while the apples are simmering, start making the crepes. You know those little holes you see in the crepes? How to get those is by spraying a hot pan with a non stick spray or adding butter right before adding the crepe mixture to the pan. 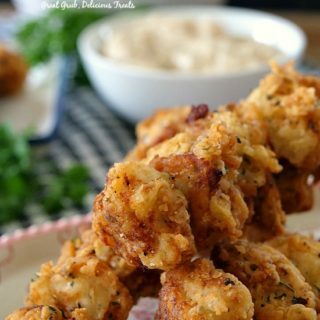 The bubbles from the spray or butter create the holes once the mixture is added. Super easy. 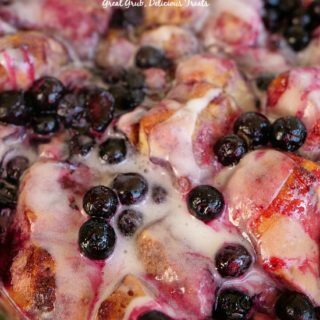 So you’ll spray the pan, place 1/3 cup of mixture in the crepe pan, or a shallow frying pan, swirl around to coat the bottom of the pan with the mixture and cook for a minute or two. Flip over and cook for additional minute or so. When making each crepe, fold it in fourths when it’s done, set it on a plate and cover with a dish towel until they are ready to be filled. 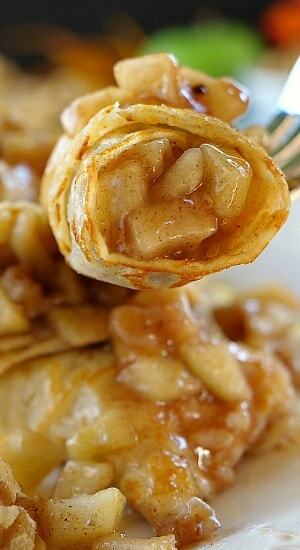 Once the apple mixture is finished, gently grab a crepe and spoon the apple walnut filling into the center. Roll the crepes up, place on a plate and sprinkle with powdered sugar. Serve warm and enjoy. 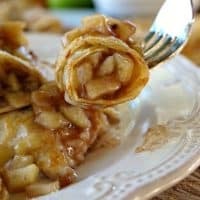 Here are a few more fall desserts that can be found on the blog: Apple Pear Walnut Crisp, Apple Pecan Monkey Bread, Apple Pecan Bread Pudding, and some Homemade Apple Pecan Cinnamon Rolls. Add 1/3 cup of mixture to pan and rotate from side to side to cover bottom of pan. In a medium saucepan over low heat, bring water, cornstarch, sugar, cinnamon and lemon juice to a boil, stirring constantly. Continue stirring for 3-4 minutes until sauce thickens up. Once sauce has thickened, add apples and walnuts, stir and let simmer for 8-10 minutes. Crepe recipe from my Cream Cheese Lemonade Blackberry Crepesrecipe. Apple walnut filling adapted from my Apple Cinnamon Filling. How many crepes does this recipe make? Thank you kindly. Hi Gail, it makes about 12. 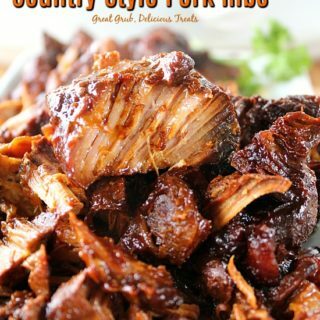 Thank you so much…can’t wait to make them. 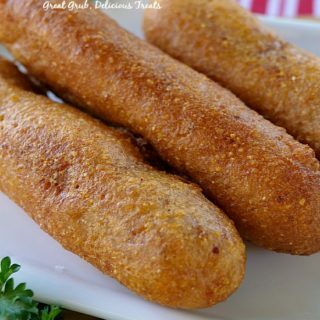 What can you use instead of crepes or pancakes? Hi Linda, you can use this on french toast as well. 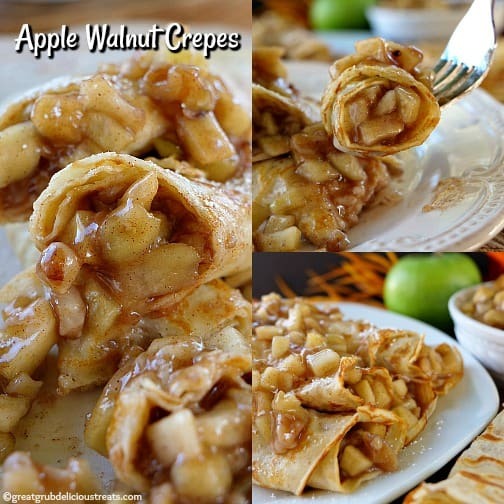 This sounds great – and my plan is to serve with pancakes…..but I think you forgot to list the walnuts/pecans in the recipe…….both ingredients and instructions.